Creating the illusion of depth with simple line drawing requires knowledge of linear perspective which was codified in 1420 by Brunelleschi in Florence, Italy. This technique, which was widely accepted and spread throughout the western world, requires a fixed eye level and an understanding of vanishing points: the place where parallel lines meet on the horizon line. But the lines remain on the surface of the paper, it is the brain that creates the sense of recession. Another intriguing way to create dimension involves crossing your eyes and focusing on two nearly identical images allowing the brain to combine them into a third seemingly dimensional image. Human eyes are set about 7 cm apart. They each record a different angle of an object and then the brain recombines these divergent views into three dimensional space. When teaching students I realize that they are often unaware of this and can get confused unless they close one eye to defeat their depth perception. I enjoy looking at stereoscopic images and wondered if I could draw one. 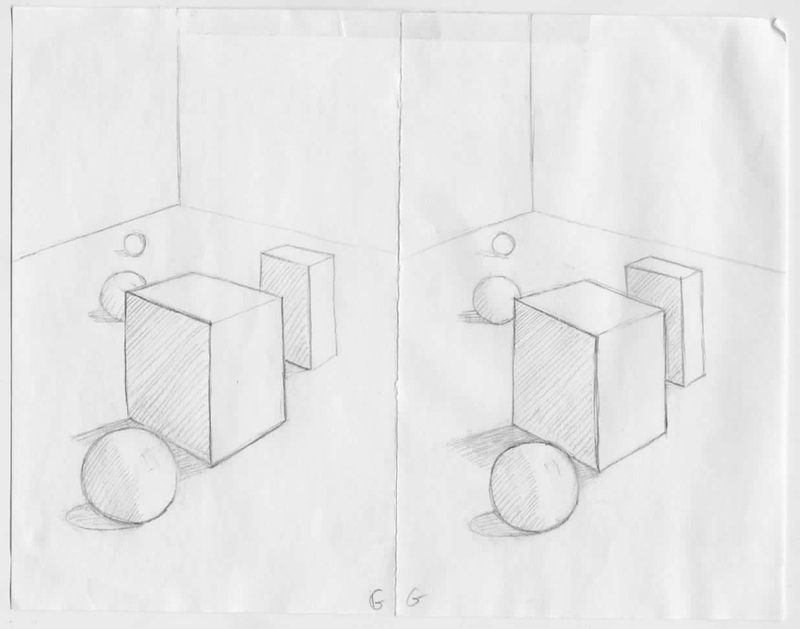 In the example below I kept the large box in the center identical in both drawings. You will notice I shifted the objects behind the box to the left and the ball in front to the right. I experimented with placement and can't really explain how much movement was necessary. Two out of four people I tested this on could not see it well or hold the image steady in their eyes. The two others saw it easily. To try it yourself just cross your eyes until you see a third image appear between the other two. Then relax your eyes somewhat and the image will come into focus. It helps to have the computer screen about a forearm's length away.